If you’re one of my yoga students, I might have mentioned that I have arthritis or lupus. That’s usually how I explain my health status in the interest of time. My current diagnosis is actually Mixed Connective Tissue Disease which is a rare combination connective tissue disease. I’m very open about the fact the I believe the reason I’m doing so well overall is my yoga practice. MCTD and yoga is a perfect combination because you can use all the aspects of yoga to help you manage the disease. Since this subject is so important to me I wrote this resource article on MCTD and yoga. Be sure and visit the MCTD Foundation site for more info about MCTD. This is a rare, complicated disease. If you know someone who would benefit from this info, please share, as there is so little info out there on this topic. Unless you or a loved one has received a diagnosis of Mixed Connective Tissue Disease, you’ve probably never heard of it. The most recent studies suggest it is the least common connective tissue disease with it affecting only 3.8 per 100,000 people[i]. MCTD is a combination disease that presents in a highly individualized manner. Fortunately, yoga’s tools of self-attunement help you discover the best disease management tools for yourself. Once you’ve made the decision to try yoga, check in with your health care provider first so you can proceed safely with informed choices. Yoga is a several thousand year old system for connecting your body, breath, mind, and spirit. Here in the West, it’s often assumed to be an exercise system for young, thin, bendy people but increasingly science is showing its benefits for everyone. As a professional yoga teacher and MCTD patient, this is a subject very near and dear to my heart. If you haven’t considered yoga before because of your health status, I hope providing some information can spark your interest and motivate you to try it out. 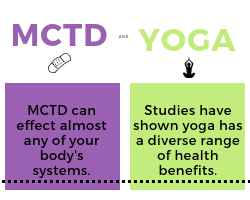 The infographic with this post covers some of the most common effects of MCTD and the relevant benefits from yoga. The most important point is, while a person can’t control their diagnosis of MCTD, they can benefit from being an empowered patient. Yoga is a low risk way to improve your health. For more resources specifically for arthritis, visit the Yoga for Arthritis website. They also have a directory of Yoga for Arthritis instructors around the country. There have only been small pilot studies on the benefits or risks for people with lupus who practice yoga. A very small study showed benefits for people with myositis who participated in an exercise program. There’s no published research on yoga for people with myositis. For more resources for yoga specifically for scleroderma, visit the Yoga for Scleroderma website. I wrote an article for the lupus blog, Despite Lupus, on how to choose a yoga class when you have a chronic illness which you can read about HERE. I’m also a huge proponent of aqua yoga for people with health challenges, because you get the benefits of yoga combined with the benefits of working in the water. You can read more about aqua yoga on my aqua yoga page. If none of the above links yielded a resource near you, also try Accessible Yoga. Accessible yoga is a non-profit organization dedicated to bringing yoga to anyone regardless of ability. They maintain a directory of providers on their website. Also, the International Association of Yoga Therapists certifies yoga therapists around the world. A yoga therapist has received additional training beyond what a yoga teacher receives. They work with you as an individual and provide a treatment plan based on your needs. Working with a yoga therapist might be an appropriate choice for you. Managing MCTD and its symptoms is a complex challenge. Yoga is one tool in your disease management toolkit that you can use for greater well being. If you’ve been inspired to try but felt overwhelmed about where to start, I hope I’ve provided you some resources to feel empowered and take the leap. Namaste! If you’d like more articles on the specific diseases that make up MCTD and yoga’s impacts, read through my blog. I have two sections. One on arthritis and autoimmune diseases, and one on aqua yoga. Aqua yoga is my focus, because it is kind to people’s joints and is so accessible. It’s an easy way to start a yoga practice, it allows people who’ve lost a land practice to continue, and challenges people with an active land practice to explore their bodies in new ways. Sign up for my email list to receive a free aqua yoga sequence designed for people living with lupus. You can have it laminated and use it poolside. Gunnarsson et al., Mixed connective tissue disease. Best Practice & Research Clinical Rheumatology 30 (2016).